WBSHFWS Notification is out. WBSHFWS is recruiting for 28 DEIC Manager Post Posts. You can check WBSHFWS - West Bengal State Health and Family Welfare Samiti last date, download WBSHFWS notification, visit WBSHFWS official website and check other WBSHFWS Vacancy details.Complete Vacancy and recruitment Details about 28 DEIC Manager Post vacancies in WBSHFWS are provided below by JobSarkari.Com only for you. Last Date for Apply Online 21/07/2018. SC / ST / OBC / PH Rs.50/-. Mode of Payment Application Fees Can be Submitted through Online / Offline Mode. DEIC Manager 13 05 07 02 01 28. Candidate Must Have Passed Master Degree in Disability Rehabilitation Administration With Graduation in Physiotherapy / Occupational Therapy or B.Sc. Nursing / Disability Rehabilitation Administration. 6.Online Application Can be Submitted on or Before 21st July 2018. Q. 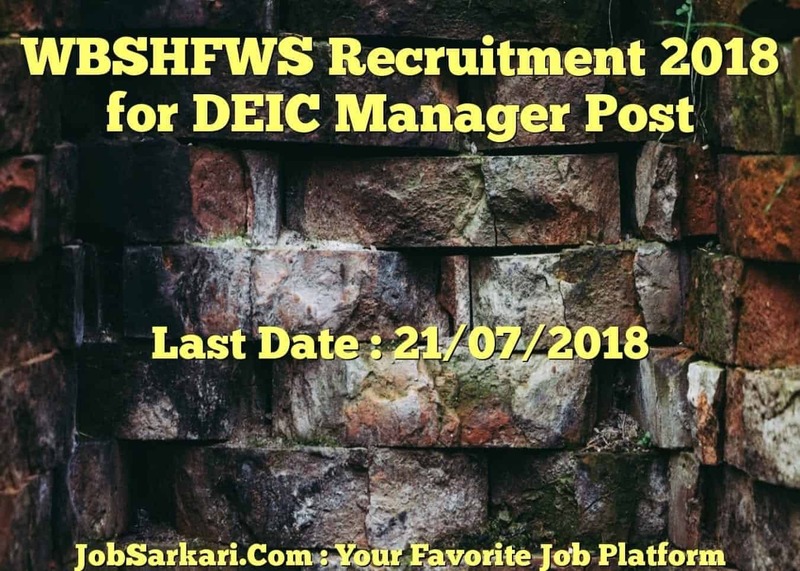 What is the Last Date For WBSHFWS DEIC Manager Post Vacancy ? A. 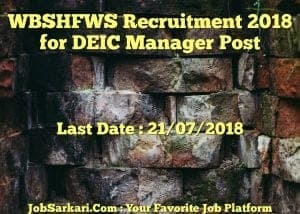 Last Date for WBSHFWS DEIC Manager Post Posts is 21/07/2018. Q. What is the Form Type of WBSHFWS DEIC Manager Post Recruitment ? A. The Form Type for WBSHFWS DEIC Manager Post Posts is Online. Q. How many vacancies are available in West Bengal State Health and Family Welfare Samiti DEIC Manager Post Posts ? A. There are about 30 Vacancies in West Bengal State Health and Family Welfare Samiti DEIC Manager Post Posts. Q. What is the Full Form of WBSHFWS ? A. Full Form of WBSHFWS is West Bengal State Health and Family Welfare Samiti .